question asked: Mar 14 '13, 6:40 a.m.
last updated: Apr 22 '13, 9:40 a.m.
How to remove RQM from existing CLM linked applications? How to force an explicit login on SSO enabled server using RTC Java API? How do I proceed if Smart cards and ssl certificats are not supported in 6.0? Simon Eickel (1.1k●6●51●56) | asked Mar 14 '13, 6:40 a.m. I'm facing logical problems while trying to synchronize from RTC to CC. The Project Structure in RTC is this that the Component contains as root element a folder named the same way as the component, e.g. Is it possible to avoid the "two dir named the same" structur? Means is it possible to get either the component name or the sub component folder name away? Masabumi koinuma (461●1●5) | answered Mar 14 '13, 6:50 p.m.
One good news in addition to this document is that, you can move or rename the 'TestMe' directory (as component) in the ClearCase VOB after the initial export. 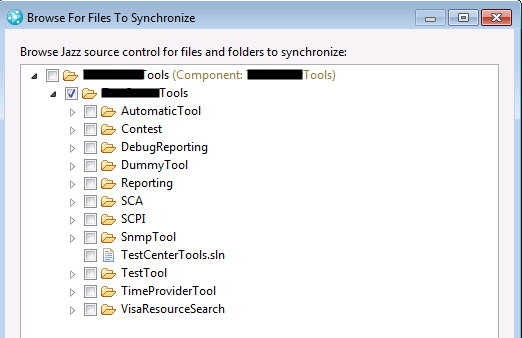 And any changes under the folder continues to be synchronized with RTC's 'TestMe' component, or vice versa. So you can arrange your component structure in whatever way you'd like to. Simon Eickel commented Mar 15 '13, 4:46 a.m. | edited Mar 16 '13, 2:24 p.m. Yes I can move the "component folder" within CC or rename it but the structure down on it stays the same. If I rename the "sub comp folder" this rename will be synced to RTC and the folder will be renamed, too. What we need it that one of them (either the comp dir or the sub comp dir) get eliminated on the CC side but stays on the RTC side. I noticed when having the "Select Files to Synchronize"-dialog I'm able to open the component and choose files and folders beyond this component. The problem is that the syncer seems just to sync components, as the "Component: >Comp Name>" is visible just behind the Component. Is it possible to choose just folders in a deeper place to sync? Masabumi koinuma commented Mar 15 '13, 9:07 a.m. | edited Mar 16 '13, 2:24 p.m.
Can you move the TestMe directory (as component) from folder1 to VOB root, remove ( or rename) the original folder1, and rename the TestMe directory to 'folder1'? You can choose a directory or file under the component root as a synchronization root, but the synchronizer maintains the folder structure under the component root when it brings over to the ClearCase. Geoffrey Clemm (29.0k●2●30●35) | answered Mar 16 '13, 2:34 p.m. The relative pathname in RTC (relative to the RTC component root) of each replicated file/directory is the same as its relative pathname in ClearCase (relative to the corresponding the ClearCase component root) file/directory. So if you have a folder named "TestMe" under the RTC component root directory, you will have a folder named "TestMe" under the ClearCase component root directory. Just for interest's sake, why is it important to have a TestMe folder in the RTC component, but not have one in the corresponding ClearCase component? Simon Eickel commented Apr 02 '13, 1:16 a.m.
sorry for late reply - I was on holiday. It's important because the project structures differs in CC and RTC in this case. In RTC they have a folder named the same as the component in which the data resides. This is because they get trouble if the data is directly beneath the component when loading the sandbox (without using "load component root as folder option"). The buildscripts won't work in CC when they have the "double folder" structure because it's missed in RTC. Geoffrey Clemm commented Apr 02 '13, 9:45 p.m.
Why aren't your users just using the "Browse the components to select the folders to be loaded" option? If they select it once, it will become the default load option. It seems like that would be the simplest approach. Simon Eickel commented Apr 04 '13, 2:17 a.m. They want to use the "normal" option as for the other one in VS they need to expand "advanced" and choose it and the project admins think this is too much overhead for the normal developer. Geoffrey Clemm commented Apr 04 '13, 10:03 p.m. | edited Apr 04 '13, 10:04 p.m.
Have you considered using load rules? You can define in the load rule file exactly how the components in the workspace should be loaded, and all your users can then use that shared load rule to initialize their workspaces consistently. Simon Eickel commented Apr 10 '13, 3:47 a.m.
thanks for your statement - yes, this is true. Load rules would be useful to get the same look and feel in the directory structure in the whole team. The problem is (same as the load function "load component root as folder") that this function is stored in the "advanced" section for creating the sandbox. The problem within this team is that they have to create a new sandbox more often than normally and that they don't want to use the sections on "advanced". In this case we do a workaround with symbolic links on ClearCase site to get the structure needed for build scripts. Piotr Aniola (3.6k●15●34) | answered Apr 22 '13, 9:38 a.m.
Simon Eickel commented Apr 22 '13, 9:40 a.m.